PDP convention drama: Secondus emerges party chairman, as Adeniran walks out. 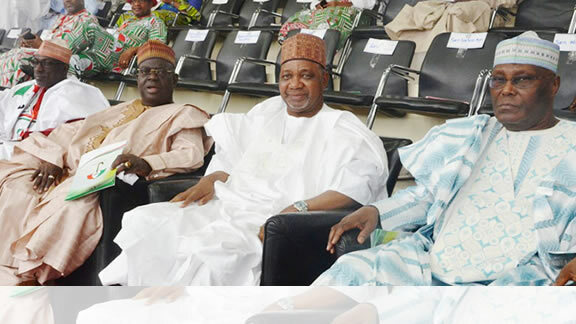 L-R: Ahmed Markafi, Babangida Aliyu, Namadi Sambo and Atiku Abubakar at the PDP convention in Abuja… on Saturday. A former Deputy National Chairman of the Peoples Democratic Party , Prince Uche Secondus, has emerged as the new chairman of the party . Secondus defeated all the aspirants who contested the coveted position with him in the election which was held at Eagle Square , Abuja on Saturday . The result of the election was declared in the early hours of Sunday. Details of the poll had not been officially announced as of the time of going to press . Secondus received strong backing of the 11 governors elected on the platform of the party , as they stood in solidarity with him throughout the exercise . Governors of Rivers and Ekiti States , Messrs NyesomWike and Ayodele Fayose , actively mobilised support openly for the new party chair . As of the time of filing this report at 12 :10 am , Secondus and Wike were still at the Eagle Square as the votes of the elections were being sorted and counted by members of the electoral committee . The unflinching support by the governors was said to have boosted Secondus’ chance in the North where Adeniran had initial support . Secondus told one of our correspondents that if declared winner , he would work with all those that contested against him. Those who contested against him but lost were Dr . Raymond Dokpesi, Prof . Tunde Adeniran and Prof. Taoheed Adedoja. Others contestants , apart from Chief Olabode George , announced their withdrawal from the race shortly before the commencement of the exercise . George said on Friday at a press briefing that he was withdrawing due to the refusal of the party to micro – zone the office of the national chairman to the South – West. The party had zoned the office to the entire southern part of the country , while it also ceded the presidential ticket to the northern region. However , while there were seven aspirants from the South – West Zone , only two showed interest from the South- South . Others from the South- West included Senator Rashidi Ladoja , Chief Gbenga Daniel, Mr . Jimi Agbaje and Aderemi Olusegun . All the aspirants except Ladoja , Dokpesi and Secondus eventually contested the election. Ladoja told one of our correspondents that he was still consulting and would speak on the outcome of the convention soon . “ I’m consulting and will speak soon. We need to study its outcome before making any pronouncements ,” he said . Secondus, in an exclusive interview with one of our correspondents in the early hours of Sunday at Eagle Square , said that the love of the party remains paramount in his heart . He said , “It is the party first . We have no other reason to remain contestants without the PDP . Our interest is in the party and the desire to wrest power from the ruling All Progressives Congress. That should be our goal . Meanwhile , there was a mild drama at the Eagle Square when Dokpesi abandoned his Edo State stand and walked to Rivers State stand to sit with Secondus as the results of the election were being awaited . Meanwhile , Adeniran , a former Minister of Education, has called on the national leadership of the party to hand over the affairs of the party to its Board of Trustees. Adeniran stated this after he walked out of the Eagle Square in company with his supporters to protest the outcome of the national convention . The Director of Media and Publicity of the Adeniran Campaign Organisation , Taiwo Akeju, who spoke on behalf of the former minister, rejected the entire electoral process . Akeju said , “We reject the entire electoral process of December 9 , 2017 . The election was grossly compromised to achieve a predetermined end in line with the illegal ‘Unity List’ prepared by Governors Nyesom Wike and Ayodele Fayose and foisted on the entire delegates. “ Consequently , we submit that this election is a sham and its result is unacceptable. We reject it in its entirety. The Ekiti State Governor, Ayodele Fayose , has asked those who contested the PDP national chairmanship seat but lost to Secondus, to accept defeat in good faith. Fayose also said he had no regret , canvassing support for aspirants on the list . He insisted that some people kicked against the list because they did not win the election. A former National Auditor of the Peoples Democratic Party , Fatai Adeyanj said on Saturday that he was disqualified from running for the office of the national treasurer of the party . Adeyanju was also prevented from accessing the Eagle Square , venue of the party ’s national convention . He was disqualified from the race because of his alleged inability to present his tax clearance. Adeyanju , who was a close ally of a former National Chairman of the party , Senator Ali Modu Sheriff, remained outside the venue, hours into the exercise . He later told journalists that the committee set up by the party for the convention deliberately screened him out. He alleged that Governor Fayose was responsible for the treatment meted out to him. He said , “The party ’s screening committee rejected my tax clearance certificate even though the document remained valid until December 2017 . “ The party also said that I didn ’t have a voter card , but I tendered my valid voter card before the committee . Apart from being close to Sheriff , Adeyanju and the then National Secretary, Prof. Wale Oladipo , were allies of Senator Buruji Kashamu . Both Sheriff and Kashamu are considered as enemies of the Senator Ahmed Makarfi- led national caretaker committee . “ When there are divisions in the leadership , people follow different groups or individuals. But when the crisis gets resolved, we should all be allowed to join the winning group without victimisation ,” Adeyanju said . He promised to go to court to seek redress after the convention .